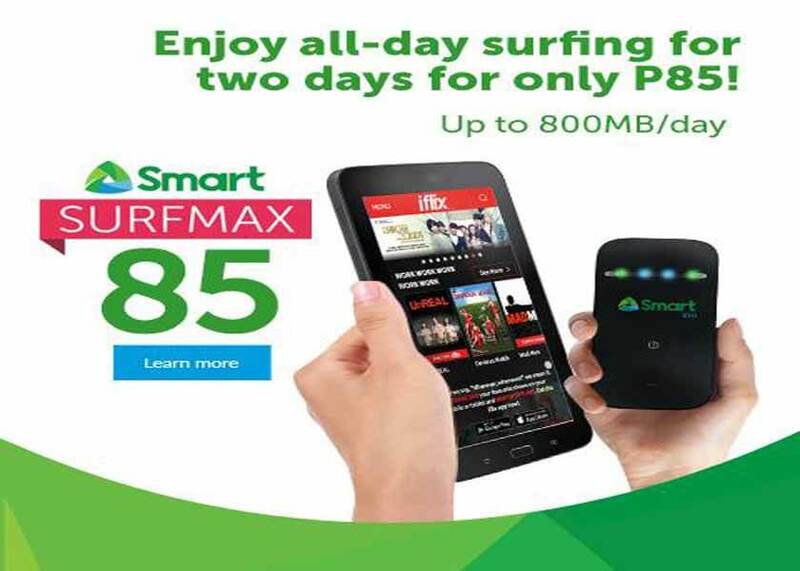 You don’t need to spend 50 pesos to enjoy daily internet surfing, Smart Surfmax 85 promo offers one time registration with 2 days validity for only 85 pesos. This promo is still unlimited, but you have daily capping of 800MB, once you teach that limit your browsing experience will drop below normal speed. Don’t worry as it will refresh on the next day, your normal speed will continue until you reached the limit again for that day. Smart also suggested to switch with Bigbytes promo e.g. to bypass the daily capping of Surfmax and continue to enjoy optimal browsing speed. Smart Surfmax 85 is available to Smart Bro prepaid and postpaid sim users. You need to load your account with 85 pesos and there’s a need of P1 maintaining balance to continue using this service. To subscribe with Surfmax 85, just text the keyword SURFMAX(amount) then send to 2200. Registration is also available via Smart Dashboard. You can use this promo on your pocket Wi-Fi, smartphones, USB broadband dongle and other network capable devices. This promo can connect to 3G, 4G and LTE network, whichever is available with stronger signal on your location. Smart will also update you from time to time regarding the remaining balance of your data until you reached the limit. "Hi! You have already consumed 100% of your daily SURFMAX allowance. In line with SURFMAX usage guidelines, your surfing connectivity may change until midnight. For all access volume data offers, you can switch to any BIGBYTES by texting BIG (denomination) to 2200 example BIG50 to 2200..."
Is ABS CBN Mobile SIM a Globe or Smart Network?